Hass avocados are oval shaped with knobbly-textured purplish-black skin. The Hass variety of avocado is the most popular, accounting for 80% of all the avocados eaten worldwide. Consumers prefer its creamy, slightly nutty flavour. Retailers prefer its durability and longer shelf life. Hass Avocados contain 11 of the 13 known vitamins. Eating half an avocado counts as one of your 5-a-day, and helps your body fight a range of diseases. Gram for gram an avocado contains almost twice the amount of cholesterol-lowering monounsaturated (or ‘good’) fat as salmon, as a result of having the same kind of healthy oil found in nuts and olive oil. Avocados are versatile, easy to prepare and eat. For inspiration on some of the many ways of using Hass avocados, visit our recipe section including new delicious Peruvian recipes. 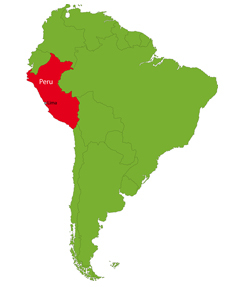 Situated on South America’s North West coast, Peru is the continent’s third-largest country after Brazil and Argentina. Despite being so close to the equator, Peru enjoys some of the best avocado growing conditions anywhere on earth. Grown in young orchards along 12,000 hectares of plantations in the fertile, low-lying coastal region of Peru, the conditions created by the Humboldt Current, almost no rainfall, yet lots of sunlight are perfect for the cultivation of Hass avocados. Peruvian Hass avocados are available in most British supermarkets from May until September.